Oh my god. I don't know if I can take the cuteness of KumaCrafts' jewelry. It is beyond adorable. 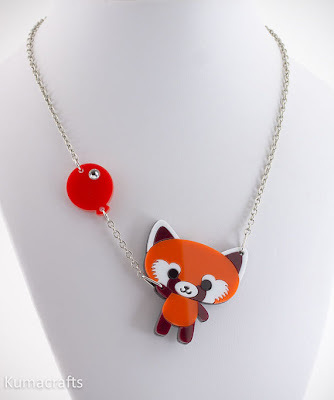 My two favorites by far are the Maneki Neko necklace—I do have rather a thing for super lucky cats—and the Happy Red Panda necklace. Now my only question is: Are they too young for me? Can I get away with wearing such over-the-top preciousness? Or will I just look like a six-year-old (or a 14-year-old Asian girl)? And, for that matter, do I care?